In 1999 TCS was the first truly handicapped accessible building in our city and so we started a ministry - to bring handicap adults and children to our school to give them a nice meal and concert. Since communism taught that handicap people were second class citizens, many of these people had been hidden from society for years. We have continued this ministry and our students have the opportunity to serve and minister to their physical needs, while reaching their hearts with a kind word and a warm smile. A few times each semester, students make the trip to the orphanage to simply spend time with the kids there, where they present a Bible story, crafts, bring snacks, sing songs and simply love on the children who are in a less fortunate situation than our volunteers. Several times a year, students and teachers prepare a program and visit the Center to have fellowship with the women and children staying there. 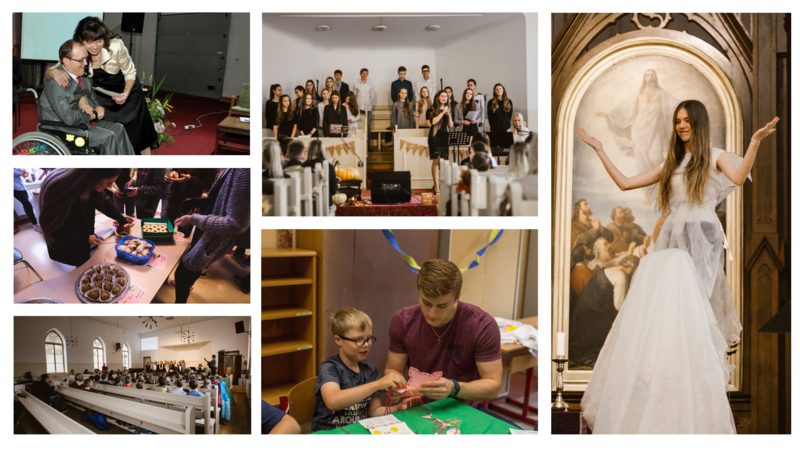 TCS students are given the opportunity to work alongside American Mission Teams as they come to Talsi to share the Gospel and the Love of Christ through the Orphan Camp and VBS. TCS students have a chance to participate in the Leadership camp during their Fall break, lead by American Christians. During the summer “SekoMan” Youth Camp takes place on TCS campus with youth from all over Latvia. TCS students have a chance to participate and grown more in Christ and fellowship with others.